I think it’s safe to say that no-one really knows when or how the exclamation mark came into existence. There’s some rather spurious speculation that it was born from the Latin for ‘joy’ – ‘io’ – by writing the ‘I’ on top of the ‘o’. Possible, but unlikely. It comes with a wildly varied nomenclature; as well as being interchangeably a ‘mark’ or ‘point’, it’s also been known as a bang, a dembanger, a screamer, a gasper, a shriek and a startler. Not bad for what is essentially a vertical line with a dot beneath it. Someone ate the last Rolo! All these legitimately use the exclamation mark to convey the emotion of the sentence, and help to drive home to readers the significance of what is being said. This is used frequently in subtitles to help convey meaning, and, unsurprisingly, can most often be found in British English. In Britain, there is even a place name whose spelling officially includes an exclamation point (Westward Ho!). There is, however, one way to use an exclamation mark that will do nothing more than drive your readers up the wall. That, of course, is this!!!!!!!!!!!!!!!!!!!!! That’s an extreme example, but in my opinion it is never acceptable or necessary to use more than two exclamation points together. Even two is pushing it, and should only ever be used in the very rare circumstances when one isn’t enough. That’s the crux when it comes to exclamation points: one is nearly always enough. One on its own can convey so much power that using more simply dilutes that power. I can safely say, after much consideration, that today’s roast dinner was the best I have ever tasted. I can safely say, after much consideration, that today’s roast dinner was the best I have ever tasted! Which would you believe was less of a hyperbole, the first or second? I would argue that while the first rings with a grave and credible sobriety, the second loses its credibility by sounding exaggerated. And that is all down to that mischievous mark. As F. Scott Fitzgerald put it: ‘An exclamation point is like laughing at your own jokes’. 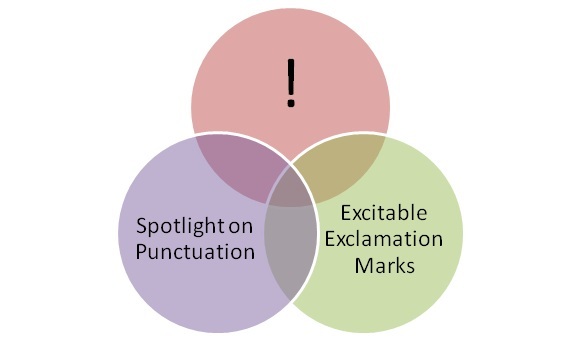 So, this week’s punctuation lesson: don’t let an exclamation mark make a fool out of you.